Hey, here’s a thought (for you like two and a half people that read this blog): What ways can we “do Halloween” that will show people God’s love and the grace of the gospel? withdraw completely and be condemning of Halloween. create an “alternative celebration” at the church building: geared toward getting the kids out of trick-o-treating… or towards “reaching out to the community”… or some combination of both. Any new ideas? Any ways we can go out and among the folks that are doing a regular ole’ Halloween and bring the kingdom? Show God’s love? Shine some light? Outside the walls of the Church? And, if you are NOT a Christian, if you are not a “church” person: what do you think? 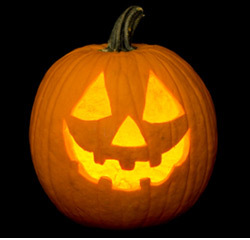 What do you think of the ways Christians have done things around Halloween? I don’t care for “hallelujah night” parties, but I’m not hiding out in the dark in my house to avoid the possible five trick-or-treaters, either. Our job is to love. To me, Halloween is for fun. as far as I am taught, God knows my heart, as well as the heart of my stepdaughter[she is 5]. we went TOTing, and had a ball.we also gave out candy to all the little ghouls as we ourselves were out and about. the comment of the night was” I have never heard of anyone giving their own candy out”. which my response was “just showing love in practical ways”. hmm, where have I heard that before. don’t be so afraid of actions that are done out of love, for without it, we are nothing. I was at an Indianapolis Pacers game recently and saw the mascot shooting t-shirts out of some kind of pneumatic, plastic, tube-gun thingy and thought that it might be cool to use one of those to shoot “tracks” at tricker-treaters ….or maybe not. Just an idea.